Regular Triple Crisis contributor Kevin Gallagher, of Boston University and the Global Economic Governance Initiative (GEGI) summarizes the key arguments in his new book Ruling Capital: Emerging Markets and the Reregulation of Cross-Border Finance. He focuses on the re-emergence of capital controls since the 2008 financial crisis—with developing-country governments reining in cross-border capital flows from “flying into their country, flying out”—and how the “policy space” emerged for such measures. José Antonio Ocampo is a professor and Member of the Committee on Global Thought at Columbia University. Kevin P. Gallagher is a co-director of the Global Economic Governance Initiative at Boston University’s Pardee School for Global Studies and a regular Triple Crisis contributor. This is an excerpt from an article originally published at Project Syndicate. The full article can be read here. As China’s economy starts to slow, following decades of spectacular growth, the government will increasingly be exposed to the siren song of capital-account liberalization. This option might initially appear attractive, particularly given the Chinese government’s desire to internationalize the renminbi. But appearances can deceive. A new report argues that the Chinese authorities should be skeptical about capital-account liberalization. Drawing lessons from the recent experiences of other emerging countries, the report concludes that China should adopt a carefully sequenced and cautious approach when exposing its economy to the caprices of global capital flows. The common thread to be found in the recent history of emerging economies – beginning in Latin America and running through East Asia and Central and Eastern Europe – is that capital flows are strongly pro-cyclical, and are the biggest single cause of financial instability. Domestic financial instability, associated with liberalization, also has a large impact on economic performance, as does the lack of control over non-bank financial intermediaries – an issue that China is now starting to face as the shadow banking sector’s contribution to credit growth becomes more pronounced. 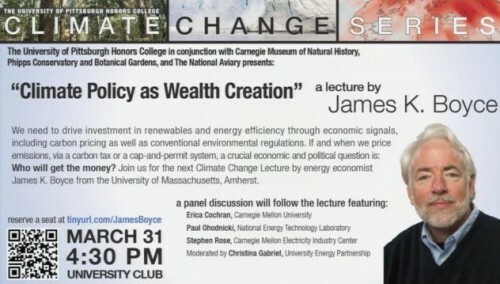 This is the final installment of a five-part series on climate policy adapted from regular Triple Crisis contributor James K. Boyce’s March 31 lecture for the Climate Change Series at the University of Pittsburgh Honors College. This installment lays out his case for a cap-and-dividend policy, which Boyce argues would put into practice the “widely held philosophical principle … that we all own the gifts of creation in equal and common measure.” The first four installments of the series are available here, here, here, and here. The full lecture and subsequent discussion are available, as streaming video, through the University of Pittsburgh website. Click here or on the image below. A carbon price is a regressive tax, one that hits the poor harder than the rich, as a proportion of their incomes. Because fuels are a necessity, not a luxury, they occupy a bigger share of the family budget of low-income families than they do of middle-income families, and a bigger share for middle-income families than for high-income families. As you go up the income scale, however, you actually have a bigger carbon footprint—you tend to consume more fuels and more things that are produced and distributed using fuels. You consume more of everything; that’s what being affluent is about. If you’re low-income, you consume less. So in absolute amounts, if you price carbon, high-income folks are going to pay more than low-income folks. Well, under a policy with a carbon price, households’ purchasing power is being eroded by that big price increase, that big tax increase. But money is coming back to them in the form of the dividend. Because income and expenditure are so skewed towards the wealthy, the mean—the average amount money coming in from the carbon price and being paid back out in equal dividends—is above the median—the amount that the “middle” person pays. So more than 50% of the people would get back more than they pay in under such a policy. As those prices are going up, then, people will say, “I don’t mind because I’m getting my share back in a very visible and concrete fashion.” I would submit to you that it’s politically kind of fantastical to imagine that widespread and durable public support for a climate policy that rises energy prices will succeed in any other way. The ongoing financial volatility in emerging economies is fueling debate about whether the so-called “Fragile Five” – Brazil, India, Indonesia, South Africa, and Turkey – should be viewed as victims of advanced countries’ monetary policies or victims of their own excessive integration into global financial markets. To answer that question requires examining their different policy responses to monetary expansion – and the different levels of risk that these responses have created. Although all of the Fragile Five – identified based on their twin fiscal and current-account deficits, which make them particularly vulnerable to capital-flow volatility – have adopted some macroprudential measures since the global financial crisis, the mix of such policies, and their outcomes, has varied substantially. Whereas Brazil, India, and Indonesia have responded to surging inflows with new capital-account regulations, South Africa and Turkey have allowed capital to flow freely across their borders.